We have everything under the sun ... and indoors too! Our wide-range of camp activities encourages campers to pursue new interests, create friendships and develop individual strengths. Our activities allow our campers to develop fitness and sports skills, enjoy the waterfront, and pursue choice-based arts, adventure, and athletic activities. Campers have the freedom to create customized camp experiences as they choose from over 30 activities. Just click on the below activities and see what sparks your child's interest. Our top-level archery instruction is a small-group activity. 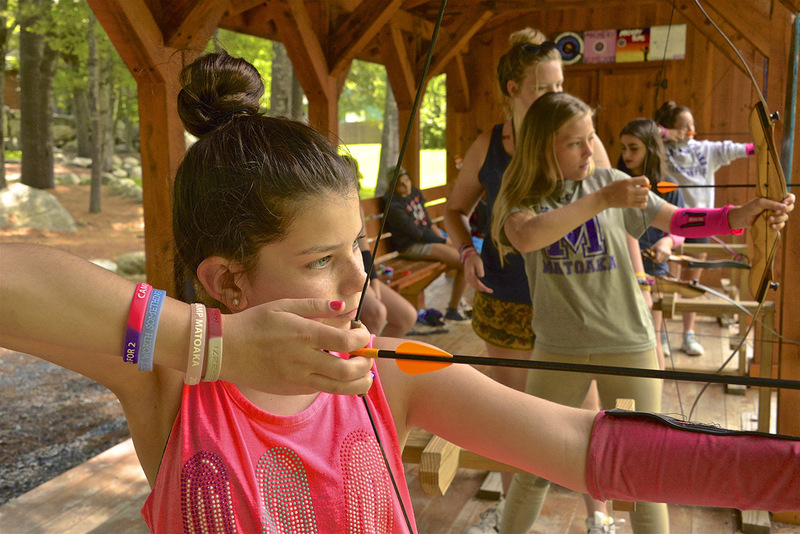 Campers have the opportunity to work on their bow and arrow skills, and perfect their bulls-eye. Our targets are often filled with balloons for fun target practice and our staff’s #1 focus is always safety. Matoaka’s 2,400 square-foot Arts Center overlooks beautiful East Lake with walls of windows and wrap-around decks. 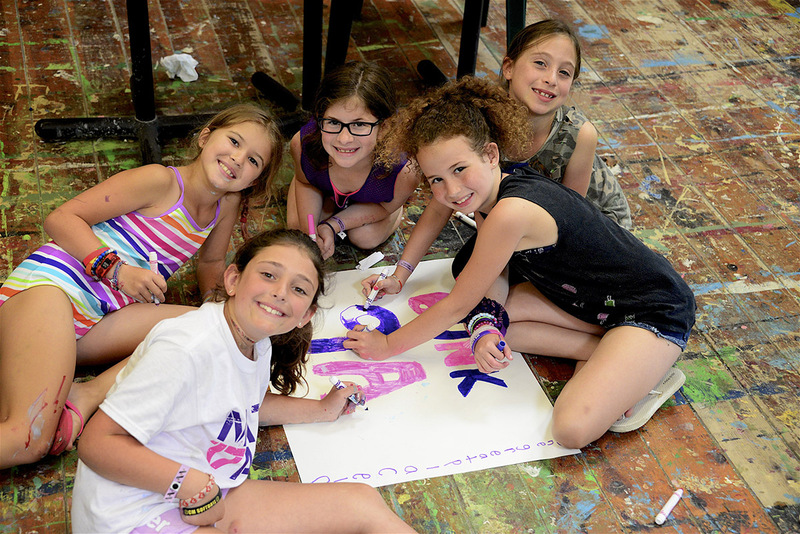 Through a variety of different arts, campers can show their unique style as they create projects to bring home as momentos of their summer at One Great Place. The Creative Arts consists of “Fine Arts,” “Camp Craft” and “Metals & Glass.” Our Fine Arts Program consists of painting, drawing and creating with myriad tools such as water colors, acrylic, crayons, pencil, chalk and tie dye. The Camp Craft Program teaches activities unique to camp such as Leather Making, Wood Burning and Bone Carving. And, in “Metals & Glass,” campers will make stained glass, metal-smithing, and jewelry making. 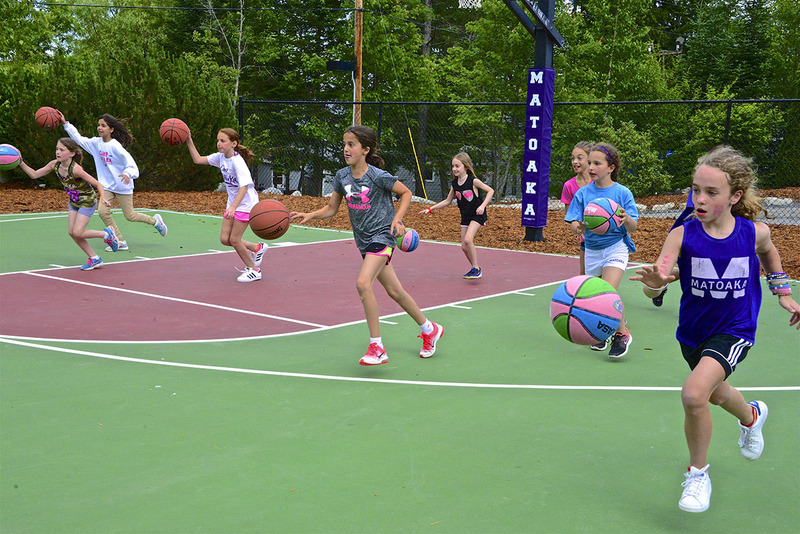 Matoaka’s Basketball Program aims to develop girls’ skills, sportsmanship and self-esteem. Counselors will teach campers all positions and levels of play and will teach girls to be leaders on and off the court. Our Basketball Court has adjustable hoops, different sized balls, and is lit for night play. Regardless of ability, campers who want to compete against other Maine camps may join Matoaka’s Basketball Team. Matoaka’s elective Riding Program consists of English-style riding taught from the seven-stable barn is located on camp, a short walk from the living areas. 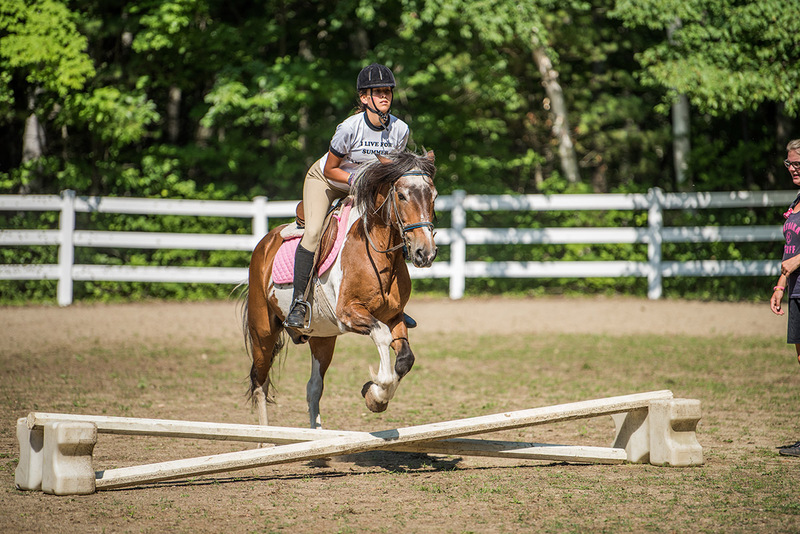 Experienced riding instructors conduct classes on all beginning, intermediate, and advanced equitation skills, from walk-trot drills to advanced competitive jumping. 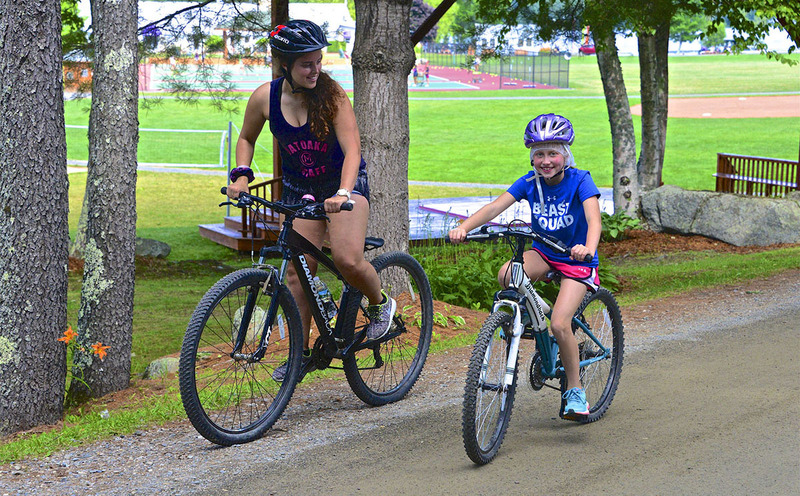 Enthusiastic riders may join the Matoaka Show Team, which competes with other camps in the Central Maine area. All campers will also receive a light horse-management course, in addition to her in-saddle instruction. Horseback Riding requires an additional fee and campers receive at least 3 lessons per week. Our Mountain Biking Program develops basic riding techniques, including changing gears correctly and simple bike maintenance, as well as more experienced riding techniques such as ascending, descending and riding over or around obstacles. On Matoaka property, we offer scenic trails of various difficulty and unique characteristics. The camper-to-counselor ratio is kept low to enable the instructor to work closely with each camper to develop her individual skills. We have different sizes and styles of bicycles to suit each camper, as well as safety equipment including helmets, knee pads and elbow pads. Bicycle helmets are required to be worn at all times. Located in the Art Center, Matoaka’s Ceramics Studio houses five electric wheels, with foot pedals to adjust the speed, as well as two, large canvas-covered tables and a canvas-covered wedging table that provides ample workspace. A kiln is kept in a separate room. Counselors encourage the girls to pursue creative ideas and teach techniques in wheel-throwing pottery, slab-building, coil and pinch pots, and additive and subtractive sculpture. 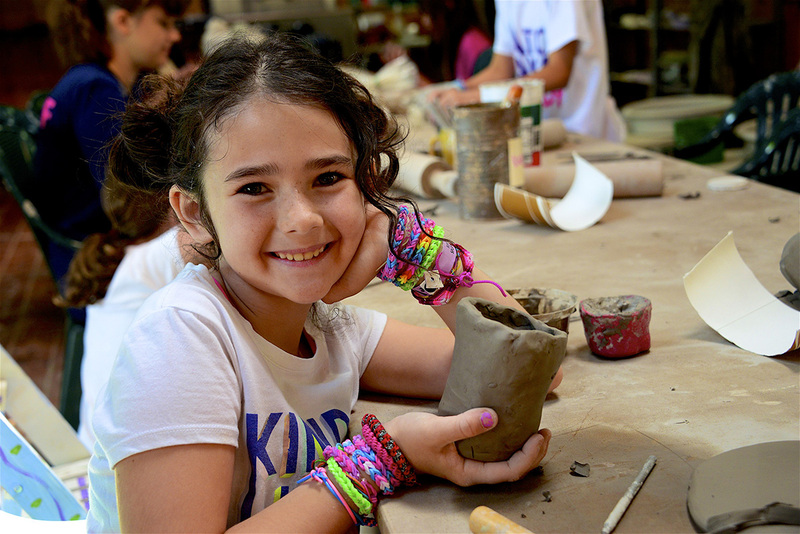 Campers’ own creativity is fostered and they create memories out of clay, including pots, signs, figurines and sculptures. Namaste! Yoga is a practice that provides greater body awareness, increased self-esteem, tools for relaxation, and a stronger and more flexible self. On a wooden platform under the tall evergreen trees, campers are guided through the benefits of this mindful practice that will help them sustain a healthy lifestyle. Matoaka is home to the largest indoor gymnasium of any camp in New England, and includes Olympic-style equipment such as a regulation 40’x 40’ spring-loaded floor, uneven bars, high and low balance beams, a vaulting table with a separate runway and springboard, myriad mats and spotting blocks, and a Tumble Track. 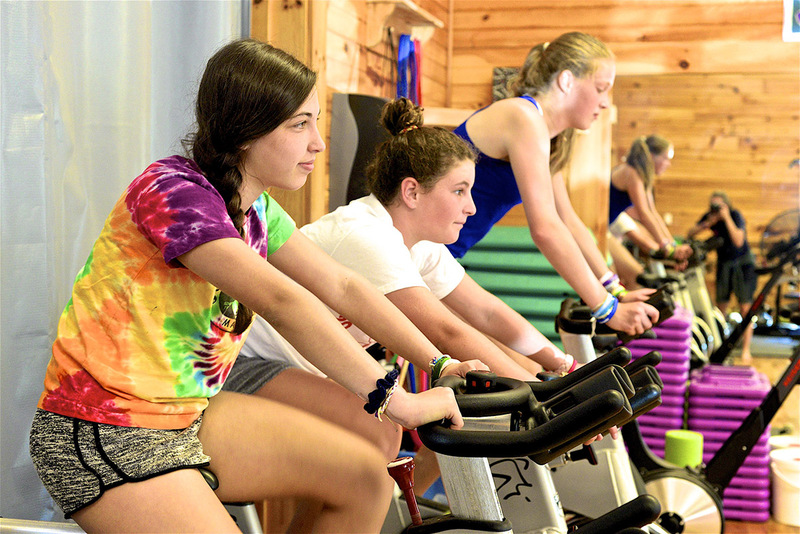 Our highly-motivated instructors have a background in competitive gymnastics and coaching, and understand that spotting campers is their #1 priority. The gymnastics program includes instruction for all campers from beginners to competitive, advanced gymnasts. Our Dance Program includes basic, intermediate and advanced instruction in ballet, jazz, pointe, tap, modern, hip-hop, contemporary and lyrical. 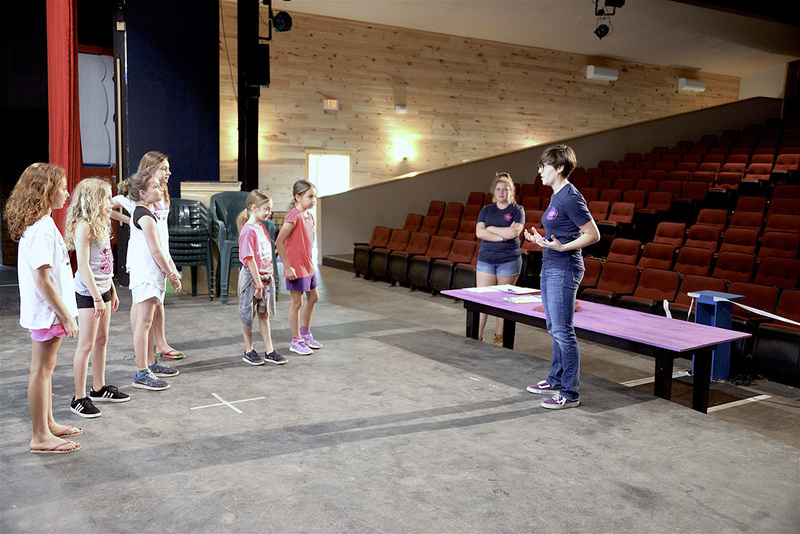 Campers receive training in basic technique and movements and, if desired, may gain experience in stage performance and choreography for dance and talent shows. Two dance studios are equipped with 30’ x 40’ cushioned, hardwood floors, mirrors, wooden ballet bars and sound systems. With two, 16-passenger pontoon boats, East Lake provides the ideal setting for fishing. Our campers are taught techniques such as rod and reel assembly, spin casting, fly-fishing, trolling, and fish identification. We practice the environmentally-friendly method of catch-and-release so the ecological balance within East Lake is maintained. 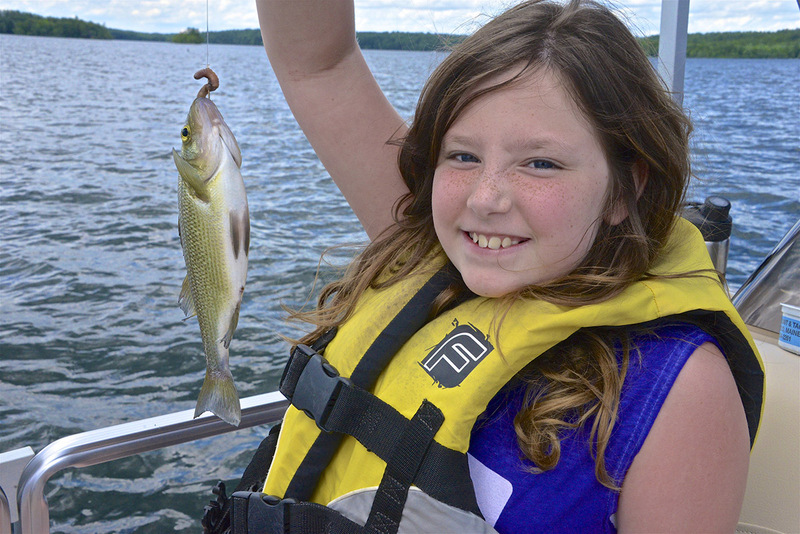 Our campers are always on the lookout for Grand-Daddy – the elusive big catch of East Lake! With safety being our number one priority, all Fishing Staff are Lifeguard, First Aid, and CPR certified, and all campers wear life jackets at all times. Located in the Arts Center, our Sewing Room has twelve, easy-to-use sewing machines and all the materials needed for both machine- and hand-stitched projects. 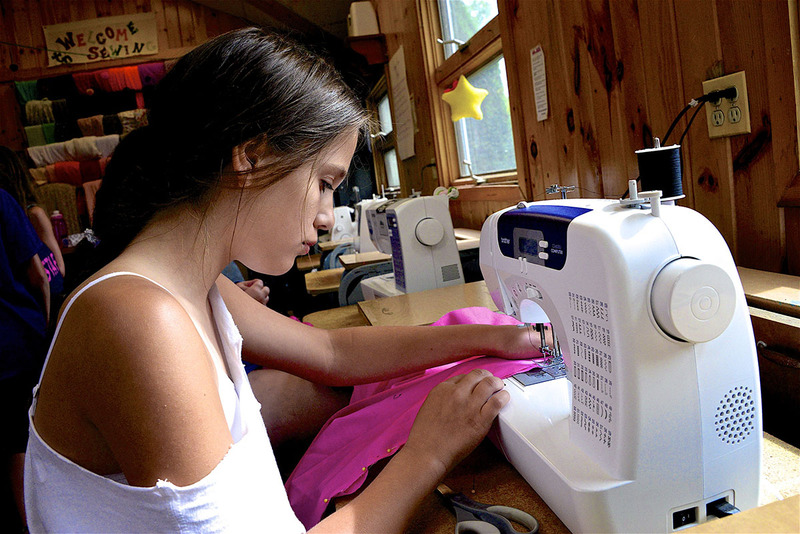 Campers may explore both the practical and artistic sides of sewing by making soft-sculpture, toys, pillows and clothing. Campers also can learn to knit, embroider, crochet and applique. The Culinary Arts Program includes beginner, intermediate, and advanced levels of instruction in cooking and baking, the nutritional value of food, teamwork, sanitation, creativity, and cooperation. From creating sweet to savory, breakfasts to desserts, campers learn kitchen and food safety, the use of utensils and certain equipment, and cooking techniques. Without realizing it, campers also are enhancing their science, math, and vocabulary skills. Added fun comes from kitchen competitions such as Cupcake Wars, Matoaka’s Top Chef and Chopped. With first-rate instruction, our Lacrosse Program provides campers with instruction in the relevant rules, skills, competition techniques, and strategies. Playing experience is provided for girls of all ages. 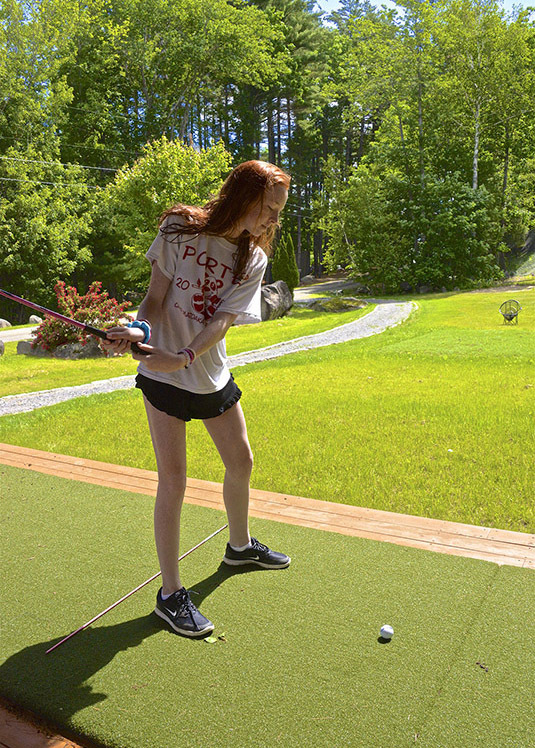 Campers can play at daily games and activities or on our elective inter-camp sports teams. 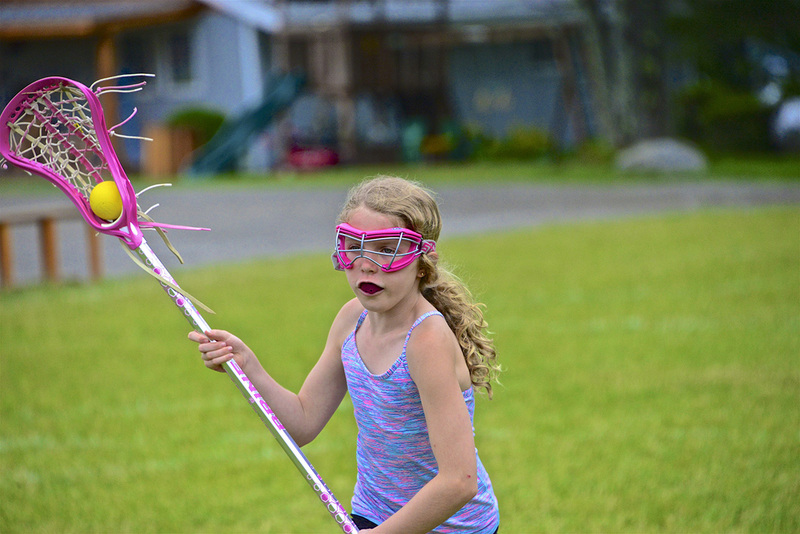 On our lacrosse field, we provide instruction to small groups of campers organized according to age and skill level. All necessary equipment is provided. Summer means swimming! Matoaka’s Swim Program is carefully planned to ensure complete safety and provide the right balance between instruction and fun. All younger campers are required to take three instructional periods per week, and all campers are encouraged to continue swim classes that meet their skills and interests. All of our swim counselors are lifeguards and are certified swim instructors who teach the latest swim techniques, including basic and advanced strokes, drills and rescue methods, according to the American Red Cross curriculum. Camp Matoaka has two swim areas: The first is located on beautiful East Pond. This 10,000 square-foot swim area includes three, fully enclosed cribs of varying depths. Our very own Aqua Park consists of two water trampolines, a Jungle Gym and “Queen of the Mountain.” The second is a 25-meter, 4 ½’ deep, outdoor, heated swimming pool with lanes for competitive swimming. There also are three, 200’ waterslides that empty into the pool, which makes Matoaka’s swimming program one of the best in camping. Whether instructional or recreational, Matoaka’s waterfront and pool are constantly supervised by certified lifeguards. Matoaka’s Tennis Program is top-notch! With a Tennis Professional who is a member of the International Teacher’s Professional Association and Division 1 College players, campers will learn from the best. On 9 regulation tennis courts, 4 of which are lit for night play, campers are taught basic to advanced competitive techniques. Private tennis lessons are available for those who want more individual instruction. 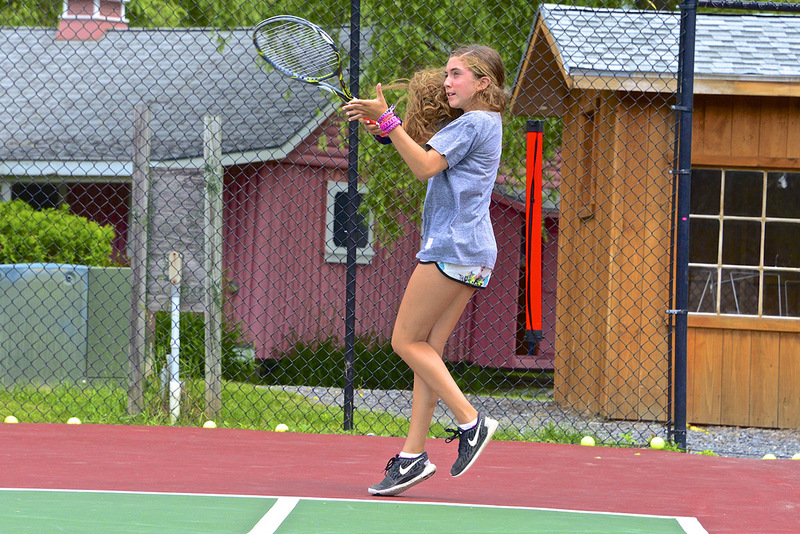 Campers may also join the Tennis Team, to compete against other camps, or participate in the annual Camper-Counselor Tennis Tournament. 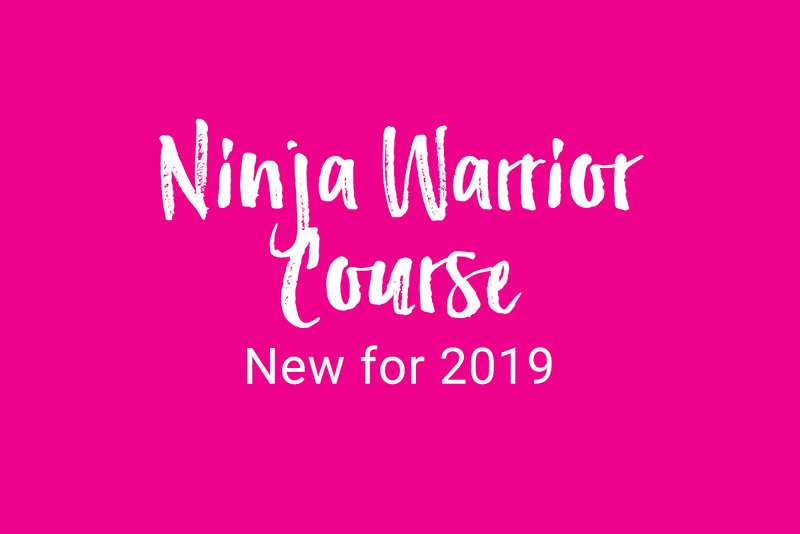 Our Challenge Course, designed and built by Project Adventure, is second-to-none and is designed to develop group initiatives, cognitive and physical problem solving, personal achievement and self-confidence. Supervised by certified outdoor adventure lovers, where safety is their top priority, campers are challenged to discover qualities in themselves they may not have known they have. Our low elements, which encourage teamwork and communication, include the Mohawk Walk, Whale Watch, the TP Shuffle, the Team Wall, Nitro Crossing, Swinging Log, Meuse, Spider’s Web, Wild Woozy and the Tire Swing Traverse. 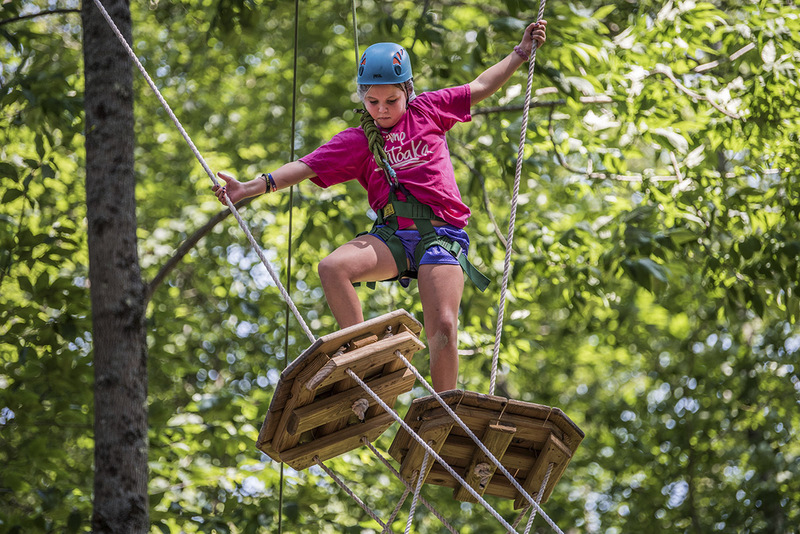 The high elements consist of the Zipline, the Multi-Vine, Pamper Pole, Burma Bridge, Two-Line Bridge, Firecracker Ladder, Caterpillar, Catwalk, Climbing Wall, Figit Ladder, Voyager Crossing and Climbing Tower and Giant Swing. The entire Ropes Course undergoes a rigorous inspection annually and our instructors complete annual instructor safety training. Our Performing Arts Center (known as “the PAC”), is a 450-seat theater, which comfortably seats the entire camp for three camper plays. Any camper who auditions for one of our performances can participate! In fact, many campers choose to work with our staff as part of the Stage Crew. The PAC Staff are also professionally trained in piano, guitar, and vocals, so our campers can sign up to work one-on-one during a scheduled period or general rec. Also, the PAC is used for evening activities such as talent shows, game shows, and outside entertainers! Our Media Arts Department teaches campers basic to advanced Television and Video skills, as well as Digital Photography and Newspaper. With individual and collaborative projects, campers will learn techniques in interviewing, researching, writing, shooting, editing and producing. They create talk shows, news programs and commercials. Through weekly video updates and production of the “Bunkline” (Matoaka’s Newspaper), campers can visually see the skills their learning. The goal of Matoaka’s Soccer Program is to make sure everyone is having fun and challenging those campers who want to gain an extra competitive edge. Our instructors are college soccer players and coaches, who teach the girls individual foot- and ball- skills, as well as teach the girls to play as a team. They empower and develop campers to reach their ultimate potential on and off the soccer field. 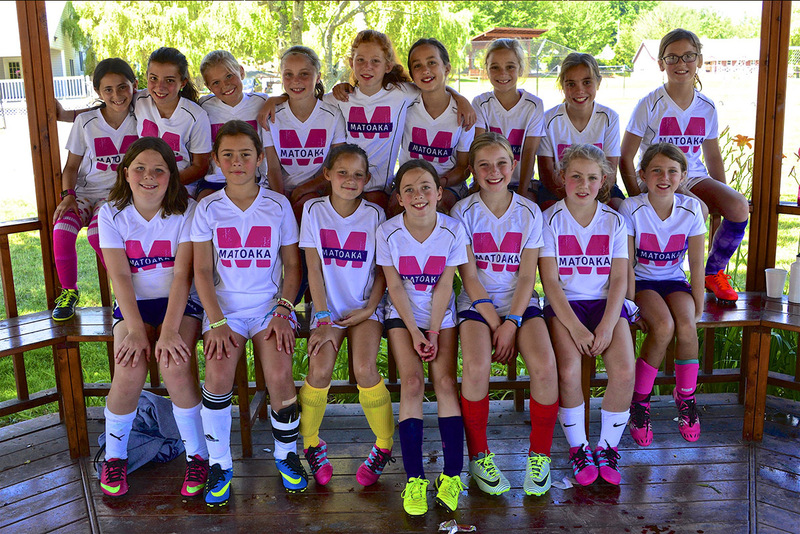 Campers who wish to compete against other Maine camps may join Matoaka’s Soccer Team. With six Malibu, competition-style ski boats, Waterski is one of Matoaka’s most popular activities. We provide instruction for first-time skiers to experts alike and stress both fun and learning while encouraging all campers to become comfortable and confident skiers. 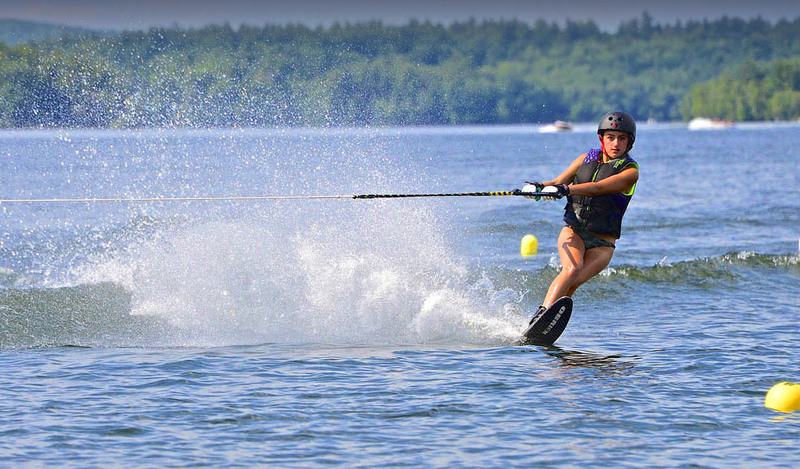 After receiving extensive land-instruction, which includes the USA Waterski safety hand signals, campers progress from two-ski skills to one-ski skills, after which they can try any of the following disciplines: slaloming, trick skiing, wakeboarding, knee boarding, wake surfing and barefooting. For fun, our ski boats also pull a 16-person banana boat and tubes. Matoaka’s equipment is top-notch and campers wear life jackets and helmets at all times. Safety is our #1 priority and our Ski Staff are all Lifeguard, First Aid, and CPR certified and must undergo WaterskiWorks’ Level 1 Instructor and Boat Driving Courses. On two beach volleyball courts, we provide instruction to small groups of campers organized according to age and skill level. Counselors, who play competitive volleyball themselves, teach the relevant rules of the game and develop a camper’s individual skills while having fun. Sportsmanship and teamwork are stressed and campers build confidence and self-esteem on the courts. 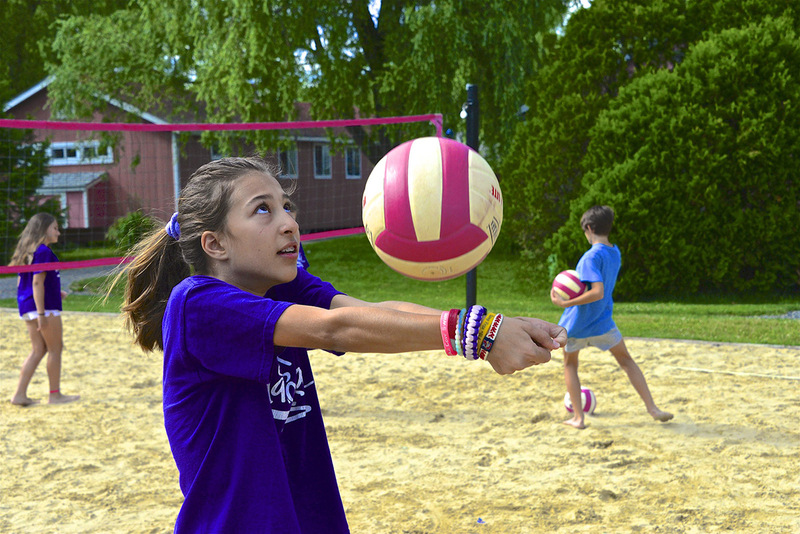 Regardless of ability, campers who want to compete against other Maine camps may join Matoaka’s Volleyball Team. 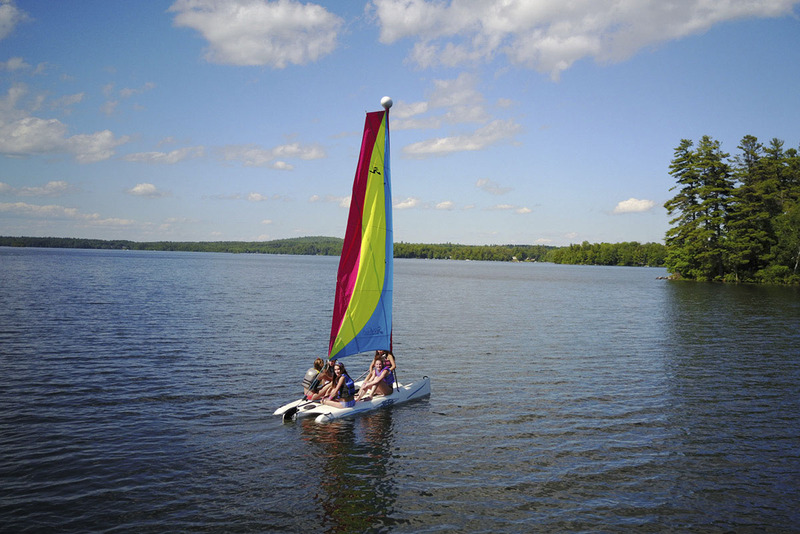 Matoaka’s Small Crafts Department teaches campers all types of boating, including Canoeing, Kayaking, Stand-Up Paddle Boarding, and Sailing, in a beautiful, calm cove. Our counselors are trained and certified by the American Red Cross in Small Crafts Safety and instruction and are all lifeguard certified. Lessons are given on nomenclature, maintenance, safety procedures, techniques, and all other basic skills needed to use every type of craft. Safety always comes first and everyone must wear a personal flotation device at all times when on the water or in any type of boat. Whenever campers are on the water, experienced counselors patrol with our jet-ski safety boat and are ready to provide immediate assistance. Matoaka has an exciting and productive Woodworking Program let by experienced staff. 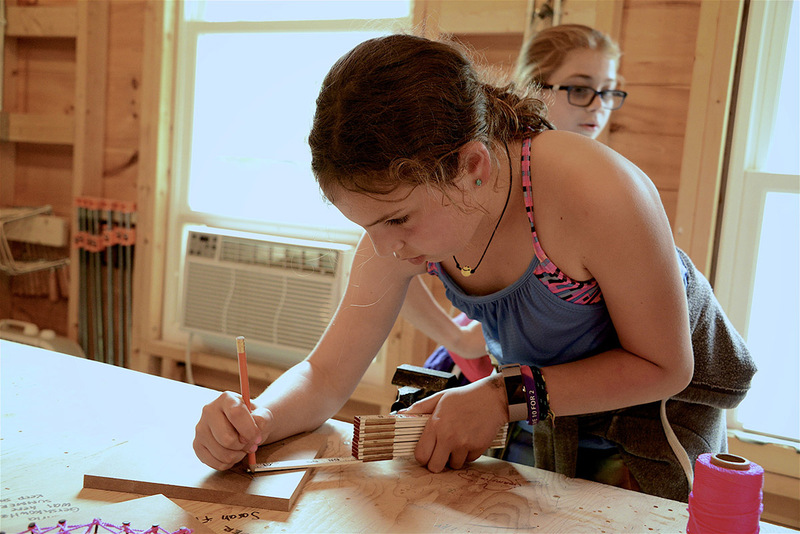 Campers learn to safely operate all of the tools and necessary machinery to build truly amazing projects such as checker boards, cheese boards, name plates, Adirondack chairs, mirrors, shelves, keychains and pens. The Martial Arts Program includes beginner, intermediate and advanced levels of instruction in Karate. Our campers focus on skill execution, self-defense, kata and sparring. Our goal of the program is to teach campers discipline, self-control, self-defense, etc., all while having fun and being active.